I call this day “decompression day”. 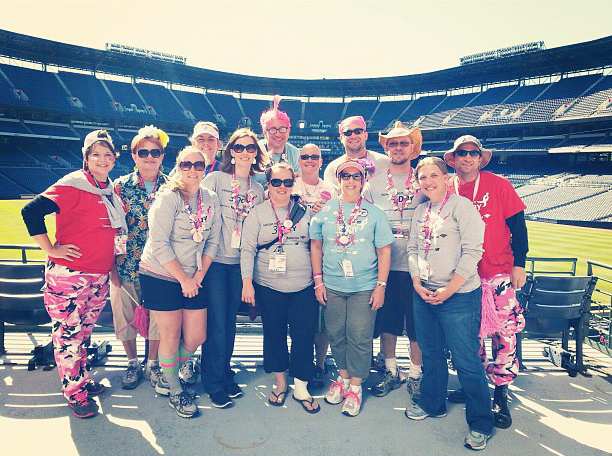 I spent the weekend in Atlanta at the Komen 3 day walk. I crewed again but it was an entirely different experience this year. This year I was with my mom, my brother and his wife, my sister and her fiance, my best friend and my “big brother” who crewed our team last year. We all signed up to be on the same pit crew this year. I had no idea if that would be a good idea or a bad idea. Close quarters and family for three days straight is sometimes dangerous. This was the first time for most of them at the 3 day event. I was excited to see how this event would affect them given that it changed my life last year. Like I said, last year was life changing. We like to call it “The Great Awakening“. I came home from that event, planned my surgery and said goodbye to my breasts. I also said goodbye to the fear, anxiety, risk and more MRI’s and mammograms than anyone should ever have to experience. I became a Previvor. I became a previvor for myself, for my loving husband, for my amazing parents and siblings, for my darling children, for my devoted friends and for those who need someone to blaze a trail ahead of them. I felt so much emotion last year about making a decision to be proactive. I was moved deep in my heart to act. This year I came to event with my own story. I feel like I had more to give this year. This event this year was about gratitude. Without research and the discovery of the BRCA gene where would I be? I feel so grateful to have been born when I was, to live where I do, to have the technology available to me, to have the learned what I have learned at this point in my life. Others have not been so lucky. It felt so big picture this year. I want to appreciate every moment and take from it everything that I possibly can. I want to live a life of purpose. I want to be intentional. I want to be a teacher. I want to be an example. Thank you 3 Day family for what you are and what I have learned from you. Thank you for raising $4.2 million this weekend to find a cure. I have so much more in my heart to write…it’s still in translation mode…working it’s way from my heart into words. Stay tuned.